7 1/4 by 13 3/4 in. 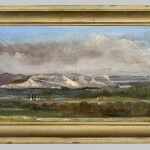 There is a sense of monumentality in this miniature panorama, and a clear understanding of atmosphere as well as distance conveyed by layers of color representing trees, a meandering river, snow-capped mountains, heavy white clouds and a blue sky. 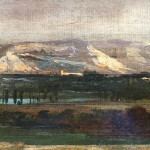 During his lifetime, Rousseau made two significant trips to the Franche-Comté and Switzerland; first in 1834 and later at the end of his career in the 1860s. Both his father and wife were from this region, and Rousseau had visited there earlier as a boy, drawing in a sketchbook even at a young age. 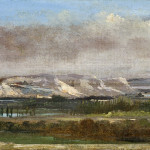 It was while travelling into Switzerland through France in 1834 that Rousseau began one of the most monumental and important compositions of his career, Mont Blanc seen from La Faucille, Storm Effect (Copenhagen, Ny Carlsberg Glyptotek); a painting he re-worked in his studio until the end of his life. 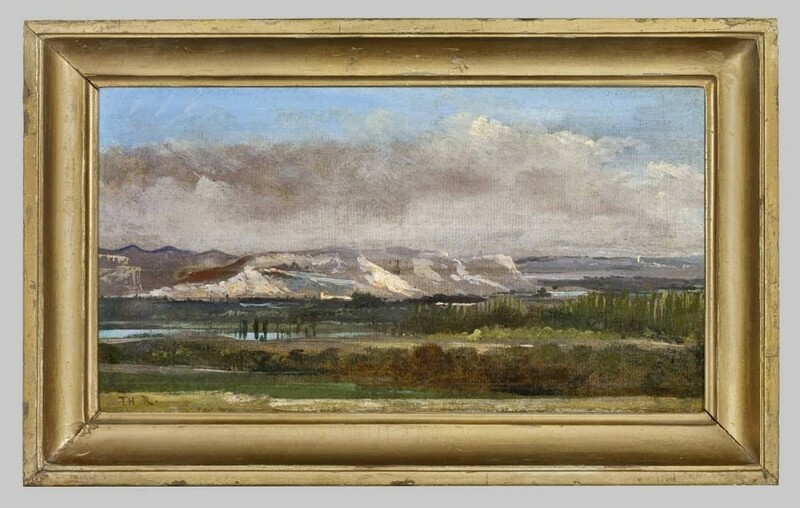 Our painting, which depicts the Saleve mountain range near Geneva, was also executed in 1834. While small in scale by comparison, it shares many similarities with the Glyptotek picture. 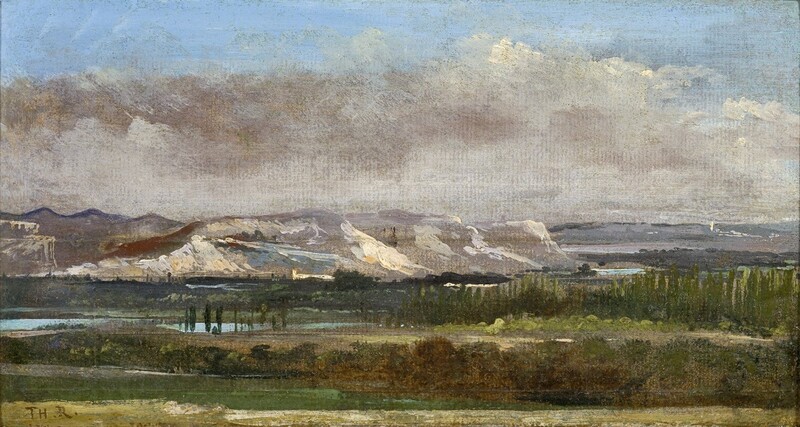 There is a sense of monumentality in this miniature panorama, and a clear understanding of atmosphere as well as distance conveyed by layers of color representing trees, a meandering river, snow-capped mountains, heavy white clouds and a blue sky. 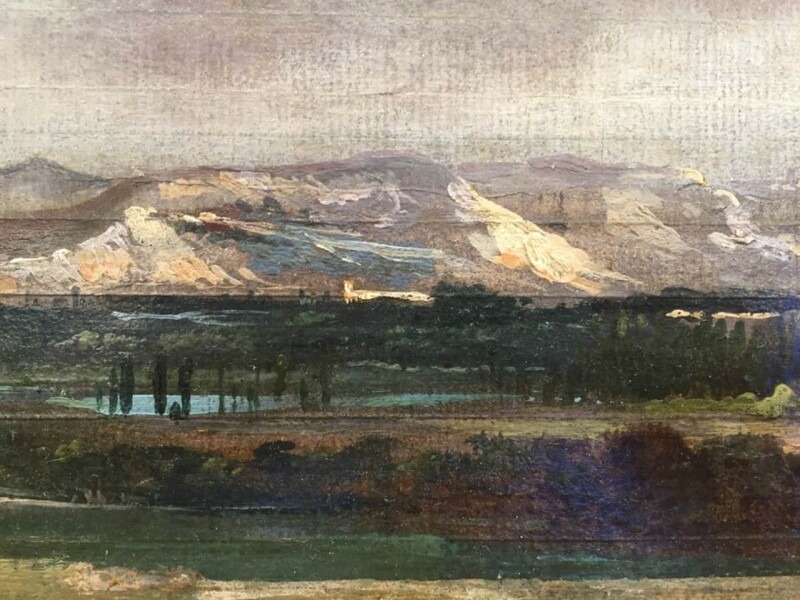 There can be no doubt this was a plein-air work; executed on paper, portable and easily transported back to Rousseau’s studio, where it most likely provided a memory of his trip and an ongoing source as he continued to revise Mont Blanc seen from La Faucille, Storm Effect. Brame & Lorenceau has confirmed the authenticity of this work and that it is included in their Archives on the artist.